You believe this does not fit together? We want to evidence the opposite. Therefore you have to come to our summer residence courses. We have chosen amazing residences and cities for you (Darmstadt, Cologne, Mannheim and Stuttgart), a young motivated team that will take care for you all the week is waiting for you. The have prepared an exciting, funny and variantly program. German teachers will offer interesting German lessons with topics which are interesting for you. You will really speak German, we want to evoke your German knowledge, not grammar and vocabularies are the main topics: just use your German. You will surprise yourself! We are convinced: you can learn German best on the place where you need it: in Germany! So, the next Summer is coming that´s for sure, also the sun is coming to Germany and you will improve your German if you are ready to engage; you will have lots of fun with young people from all over the word. This will be an unforgettable Summer. We are looking forward meeting you here in Germany! Darmstadt is located in the south of the federal state Hesse, it belongs to the Rhine-Main-area and is located very central in the heart of German – Frankfurt is 30 km in the North, Wiesbaden and Mainz are 40 km in the Northwest, Heidelberg is located 50 km in the south. Darmstadt has about 150.000 inhabitants including 40.000 students. Darmstadt bears the name „City of Science“ since 1997, because it is a very important destination for studying (Technical university and university of applied science) and researching. In Darmstadt there is also an important branch of the European Space Agency (ESA). Darmstadt is also one of the most important centers of Art Nouveau what can be marveled at “Mathildenhöhe” (in walking distance to the residence). The location of our residence at the romantic and historical lake „Großer Woog“ promises recreation right in the city center. We´ve got 5 modern class rooms. The students will be accommodated in 2- or 4-bed-rooms. All rooms have bathrooms and WCs ensuite. WIFI is available. The house is located directly beside the swimming lake. Quite near are play grounds and sport fields as well as a skating area. The interesting city center is nearby. 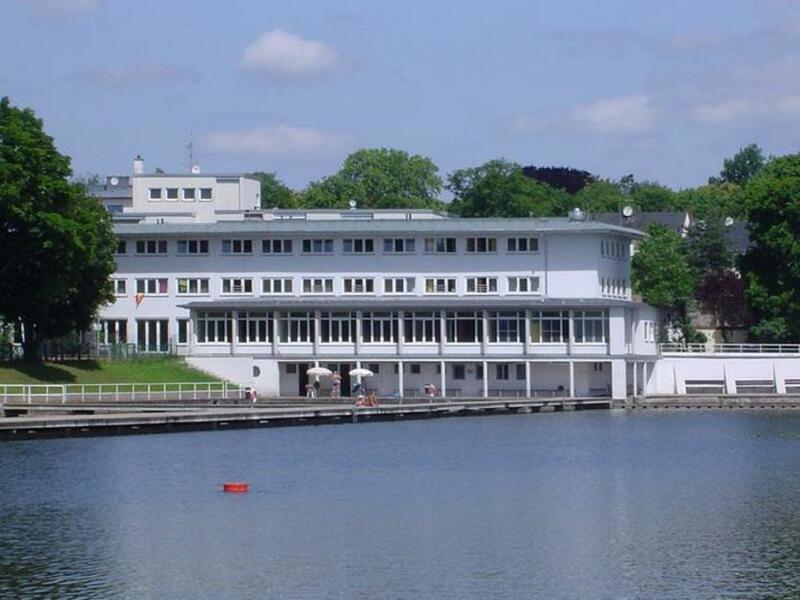 The summer residence course in Darmstadt is designed for the age group 12 till 16 years. The course in Darmstadt is running from Sunday, 05th of July till Saturday, 25th of July 2015. The minimum stay in Darmstadt is 1 week, the maximum stay is 3 weeks. Arrivals are always on Sunday, departures are always on Saturday. Accommodation in a more-bed-room (up to 4 beds), bathroom and WC ensuite. daily activities: leisure time program in the afternoon and in the evening. Health insurance for the period of your stay with us.